A casual observer could be forgiven for believing that the tobacco industry – for so long a fixture as permanent as its two main by-products, death and taxes – is itself on its last legs. In the US, health officials have predicted that smoking rates in America could drop to as low as 5% by 2050, well within the lifetime of someone born today. Last year, shareholders of UK-based Imperial Tobacco approved a decision to change the company’s century-old name to Imperial Brands, hinting at a move away from traditional cigarettes. Even globe-straddling colossus Philip Morris International (PMI), owner of brands including Marlboro, has set its stall out for a “smoke-free” future, where nicotine addicts get their fix from vaping and other non-tobacco products. Yet, for all of these predictions, one thing has remained unchanged: Big Tobacco is thriving, profitable and increasing its sales. Excluding China, where the market is monopolised by the state, five major companies dominate the global tobacco trade – Philip Morris International (PMI), British American Tobacco, Japan Tobacco, Imperial Brands and Altria (the former US assets of PMI). Between them in 2016, they shipped 2.27tn cigarettes, more than 300 for every man, woman and child on the planet, racking up combined sales of $150bn (£115bn). Their combined profits reached $35bn (£27bn), allowing investors in those companies to receive dividends of $19bn (£14.5bn). Of these giants, one of the most powerful is British American Tobacco (BAT), the London-based firm that can trace its history back to 1902. Run from Globe House, its headquarters next to the Thames river, BAT sells its brands in 200 countries and is market leader in 55 of them. Far from looking to a future beyond tobacco, BAT is doing perfectly well as it stands. At its annual meeting in March, chairman Richard Burrows toasted a “vintage year”, as profits rose to £5.2bn ($6.7bn) allowing the company’s shareholders to take a dividend worth an additional 10%. The rewards were so great because BAT’s sales show no signs of the industry’s much-vaunted decline. The company sold 665bn cigarettes in 2016, nearly 100 for every human on earth and 2bn more than it sold the year before. Cigarette sales among its so-called Global Drive Brands – Dunhill, Kent, Lucky Strike, Pall Mall and Rothmans – jumped 7% to 346bn. In the section of its accounts that details non-cigarette sales, which the company terms “next generation products”, there is nothing to see. The numbers are so small that they are considered immaterial to its financial results and do not need to be disclosed under stock market rules. Yet the company’s traditional business continues to generate big headlines and bigger numbers. By the end of the year, BAT is likely to have completed a landmark $49bn deal to buy the 57.8% of US tobacco giant Reynolds American that it does not already own. A simultaneous shareholder vote next Wednesday by both firms is expected to agree the deal at Reynolds HQ in Winston-Salem, North Carolina, and BAT in London. If US tobacco sales really are set to fall off a cliff, that would be a monumental strategic misstep. But while the percentage of Americans who smoke is on the wane, the US remains a market with huge potential. That’s because the population is rising, meaning that even as smoking rates decline in percentage terms, the actual number of smokers is relatively static at about 45 million people. US cigarettes are also relatively cheap compared with prices in the UK, leaving some scope for the company to raise prices without losing customers. Reynolds and BAT will also look to the future by pooling research on smokeless products, hoping to capture that growing market, though that won’t be the big money-spinner any time soon. And then there is the developing world, where the rate at which governments and public opinion are turning against tobacco differ dramatically from wealthier economies. BAT increased its revenues in every region bar Asia-Pacific last year, with the developing world doing more than its share of the heavy lifting. Among the “key markets” listed in its annual report are Indonesia and Egypt – and for good reason. The World Health Organisation projects smoking rates in Indonesia to increase by 2025, with the number of smokers growing from 73m to 97m based on current trends. 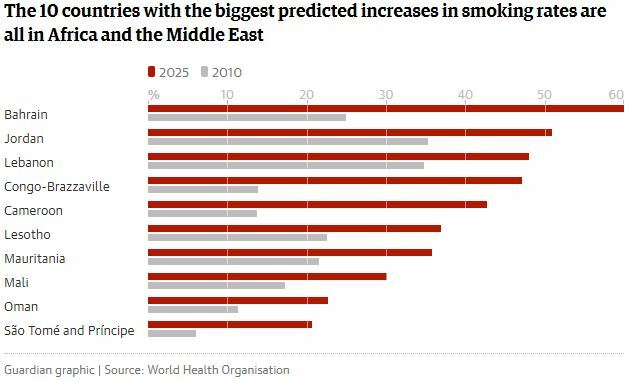 Egypt is another key market where smoking rates are projected to grow, with up to 21m Egyptians forecast to be smokers by 2025, compared to 14m in 2015. One only has to look at BAT’s roster of investors for evidence of the confidence that well-informed institutions with deep pockets have in the future of cigarettes, even if that future is less bright in the West. It’s a list that features nearly every major investment company in the world, testament to the safe bet that tobacco giants such as BAT offer to investors. Top of the share register is BlackRock, the all-powerful asset manager that has a stake in nearly every major listed company in the world, managing investors’ funds of approximately $5.4tn, more than the economy of Japan. Some way further down the list is Woodford Investment Management, run by Neil Woodford, a figure held in awe in London for his uncanny ability to make money. He famously invests a huge chunk of his portfolio in tobacco, explaining that he is not paid to make moral judgments but to make money for clients. Tobacco is attractive to investors – including councils in the UK – because it is seen as a “defensive” stock, in other words a good place to invest money that you are not prepared to lose. The shares rarely decline in value even when times are tough and also deliver a steady income from annual dividends. The huge rewards on offer for investors mean that those who manage the great behemoths of tobacco are also handsomely rewarded. BAT chief executive Nicandro Durante is no exception. He was handed a package of cash and shares worth $10m (£7.6m) last year, taking his earnings over six years to a cool $44m (£34m). When fellow directors are included, the 14-strong BAT boardroom enjoyed a combined $18m (£14m) payday in 2016. There are other perks. Durante gets free tax advice from the company, a personal driver and security for his homes, in London and Brazil. Both executives and non-executives also have access to a walk-in GP clinic near BAT’s headquarters at Globe House in London, enjoying the benefits of a National Health Service that has been estimated to spend up to $6.5bn (£5bn) a year on smoking-related illnesses. BAT’s board earn their corn as much for their network of connections as they do for their hard work. Burrows is a former governor of Bank of Ireland, while senior independent director Kieran Poynter is a managing partner of Big Four accountancy PricewaterhouseCoopers and previously advised the UK’s Treasury. Its non-executive directors boast a string of similar appointments at multinational companies. Savio Kwan, for instance, was chief operating officer of China’s largest internet business, Alibaba. Ann Godbehere ran the finances of Northern Rock after its bailout and also serves on the boards of mining giant Rio Tinto, Swiss bank UBS and insurer Prudential. Nor does the company’s network of influence end there. While it does not donate money directly to British political parties, it does funnel cash to influential right-leaning thinktank the Institute of Economic Affairs. BAT gives the IEA around $52,000 (£40,000) a year, a sum equivalent to about 5% what the organisation pays its staff, some of whom appear frequently in the media to criticise tobacco control legislation such as plain packaging. Chief among those staff is director-general Mark Littlewood, a former press spokesman for the Liberal Democrats and one-time adviser to David Cameron. Littlewood has been a vocal critic of tobacco control legislation such as the ban on smoking in pubs, as well as plain packaging. The IEA has also received funding from Philip Morris International and Japan Tobacco International. Nicandro Durante joined Brazilian subsidiary Souza Cruz in 1981, and rose through the ranks over three decades until he was appointed chief executive in 2011. He had impressed the company’s senior management during a two-year stint as regional director for Africa and the Middle East, key areas of future growth for tobacco companies facing up to declining smoking rates in more developed economies. Born to Italian parents in 1956 in Sao Paulo, he played football for the city’s Corinthians team in his teens before going into business. Married with two children, Durante stopped smoking cigarettes in favour of cigars, but has no qualms about tobacco, which he described as a “very ethical” industry in a 2012 interview with the Financial Times. In 2015, he fielded allegations from a former employee in Kenya that BAT bribed officials for various purposes, including the undermining of tobacco control laws. In 2016, Durante was handed a package of cash and shares worth $10m (£7.6m), taking his earnings over the past six years to a cool ($44m) £34m. Addressing BAT’s shareholders earlier in 2017, Burrows toasted a “vintage year”, in which the company shrugged off bribery allegations in late 2015 to record rising profits. Some investors were less keen on Burrows when he was named chairman in 2009. Burrows had resigned as governor of Bank of Ireland, leaving the lender in dire straits, with big losses and mounting debt threatening its very survival. Tens of thousands of the bank’s mortgage customers were plunged into negative equity and the lender eventually needed a state bailout that enraged many Irish people. As the bosses of rival lenders faced public opprobrium for their stewardship of the country’s banking sector, Burrows got out just in time, landing the chairmanship of BAT in 2010. But BAT wasn’t concerned by his record in banking, looking instead to his 22 years with Irish Distillers, during which time he was credited with turning Jameson whiskey into an internationally-recognised brand. The Dubliner, 71, is a non-smoker who is married with four children and enjoys sailing and rugby. He is also chairman of investment company Craven House Capital, whose assets includes beachfront land in Brazil. He is a non-executive director of Rentokil and Carlsberg. After a near 40-year career with global accounting giant PwC, which put him among the ranks of the UK’s best-paid accountants, Kieran Poynter joined BAT’s board as senior independent director. He brought with him valuable connections, having served as an adviser to former UK chancellor of the exchequer Alistair Darling. Poynter, a Chelsea FC season ticket holder, is a former director of the salubrious Royal Automobile Club, the gentleman’s club on London’s Pall Mall. He also sits on the board of F&C Asset Management and IAG, the parent company of British Airways. Ben Stevens looks after BAT’s money, and has spoken about how the company is growing market share and looking for acquisitions in Asia and North Africa. Part of his role is trying to convince governments not to raise excise duty on cigarettes too quickly, according to an interview he gave with financialdirector.co.uk. In the same interview, he referred to the need to have a “thick skin” because of the number of people “bashing tobacco companies”. Stevens gave up smoking nearly 30 years ago, two years before joining the company. But said in 2013 that profits would come from “combustible tobacco” for the near future. Yesterday morning, Australia’s tobacco industry woke to the latest chapter in the book documenting its inexorable decline. The Australian Institute of Health and Welfare released data from its 2016 National Drug Strategy Household Survey, which it has conducted every three years since 1985. While it was always going to be hard to show even further decline in teenage smoking from what was an already very low level, it’s happened again. The proportion of teenagers (aged 12-17) who have never smoked more than 100 cigarettes significantly increased between 2013 and 2016, from 95% to 98%. Smoking more than 100 cigarettes in a lifetime has long been used in Australia as a benchmark question to sort curious, experimental smokers from more committed and addicted smokers. Younger people also continued to delay when they first smoked their first full cigarette. This increased in the 14 to 24-year-olds from 14.2 years in 1995 to 16.3 in 2016 (a statistically significant increase from 15.9 years in 2013). Younger adult smokers are the only source of replacement smokers … If younger adults turn away from smoking, the industry must decline, just as a population which does not give birth will eventually dwindle. We’re targeting people who have not yet started, and that’s the key to this plain packaging announcement – to make sure we make it less attractive for people to experiment with tobacco in the first place. As Australian young people have turned away from smoking, the tobacco industry is left scrambling for new ways to addict young customers to nicotine. The proportion of people of all ages who smoke was also not good news for the tobacco industry. The percentage of people aged 14 and over who smoke daily is down from 12.8% in 2013 to 12.2% in 2016. While any decline is welcome, this was less than it should have been, and the first time in two decades that a statistically significant fall was not recorded. There are several factors likely to be responsible for the previously brake-less downward slide in smoking. Long-time campaigners Mike Daube and Todd Harper have set out nine strategies the Australian tobacco industry has used so it can keep earning from the deaths of two in three Australian smokers likely to die from using their products. Two critical factors here are price discounting and the dramatic rise of roll-your-own tobacco. Plain packaging means brand differentiation is gone as all packs look the same, except for the written brand name. So, the ability of branding to convince gullible smokers that premium (expensive) brands are somehow “better” and worth spending more on than cheaper, budget brands goes out the window. After plain packaging was introduced, there was an industry-wide decision to cut prices to compete with lower priced brands for market share. There were large tobacco tax rises in the run-up to plain packs being introduced (25% in 2010) and a further 12.5% each year from 2013 to 2016. Again, the tobacco companies cut their margins by desperately trying to keep some brands below A$20 a pack, a price known to trigger quitting. These practices may see renewed interest in floor pricing of tobacco products, when a price is set below which a product cannot be sold. Tobacco companies have also aggressively pushed cheaper roll-your-own tobacco by introducing loose tobacco with cigarette brand names. The tax in roll-your-own tobacco will rise from September 2017, which may see a further round of price discounting to try and stop people quitting. The use of roll-your-own cigarettes has gone from 26% of smokers in 2007, to 33% in 2013 and to 36% in 2016. Lower price is one factor driving this, but so too are the quite erroneous beliefs that roll-your-own tobacco somehow contains fewer additives and is less harmful, an issue I will explore in my next column. The increase in roll-your-own cigarettes since 2007 has been largest among smokers aged under 40 (increase of 82% for young adults and 70% for smokers in their 30s between 2007 and 2016). Between 2013 and 2016 roll-your-own use in smokers in their 30s jumped from 29% to 37%. Sustained and adequately funded mass media campaigns are a vital component of strategies health authorities recommended to change health behaviours, like smoking. And with smoking, one of the most obvious pieces of evidence comes from ex-smokers about why they stopped smoking. There are light-years between the answer that has always been given (concern about health) and everything else (cost, social unacceptability, pregnancy etc). In this study of smokers in 20 US communities, 91.6% of ex-smokers nominated “concern for your own current or future health” as why they quit compared with 46.5% who nominated “pressure from family, friends or co-workers”. Without large scale, on-going campaigns that reach large proportions of the population with unforgettable, motivating information about why smoking is so harmful, the core driver of quitting and not starting smoking may wane. Regrettably, Australia’s world famous national tobacco campaign that started in 1997 and has been used by many other countries, has been mothballed since 2013 when the Coalition government took office. Smokers still get sporadic small bursts of quit smoking ads on television in some states from state health departments. But they are not getting a fraction of the highly motivating exposures that were a big part of our earlier rapid declines. This absence is almost certainly a major factor explaining the slow down in people quitting smoking. The latest stats show that while around 31% of smokers (ie 3.8% of the 14+ population) had ever tried e-cigarettes, 20% seemed to have done so out of curiosity (once or twice) with only 4.4% currently using them (the remaining 6.8% no longer use them). Just 1.5% of smokers were using e-cigarettes daily (0.8% of ex-smokers and 0.2% of never smokers). There’s no evidence from these very small numbers that e-cigarette use is contributing to falling smoking in Australia. Many are concerned that the tobacco industry (which has bought into vapourisers big time) has a business plan to have smokers vape and smoke, not vape instead of smoking. If that plays out, increases in vaping may in fact act to further slow people from quitting smoking. The next few years will provide important information on this important issue. 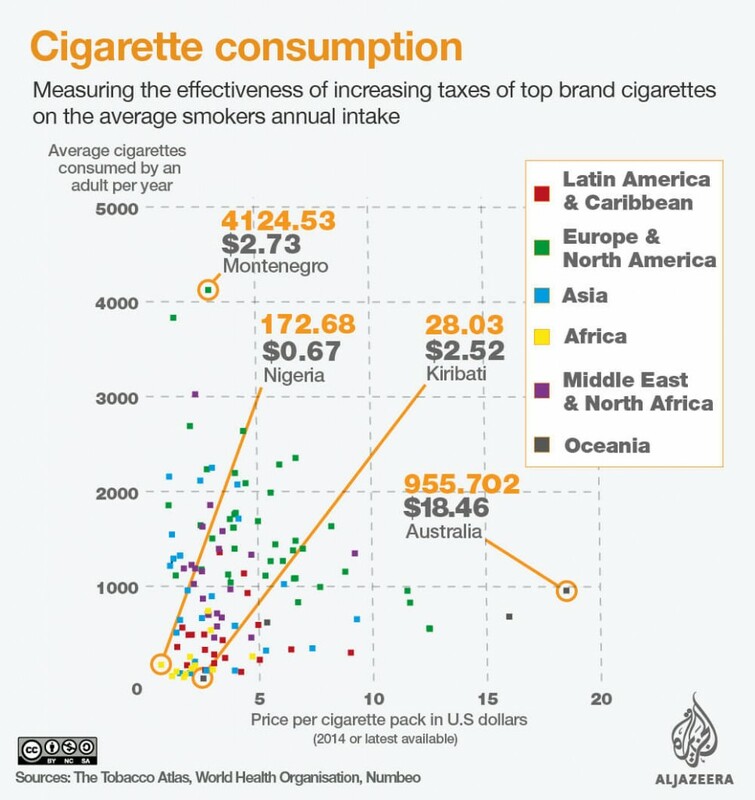 WHO says increased taxation on tobacco is least expensive and most effective tool in reducing smoking worldwide. Tobacco remains one of the major risk factors for a number of chronic diseases, including cancer, lung and cardiovascular diseases. The World Health Organization (WHO) estimates that tobacco is responsible for the death of around seven million people across the globe every year. Over the last two decades, there has been a significant reduction in the percentage of people smoking every day across the world, but the WHO says a lot more needs to be done to deter people from smoking cigarettes. In a bid to curb consumption, governments have been enforcing stricter regulations on tobacco products and their usage. Several countries are increasingly implementing strategies to tighten their tobacco policies in the hopes of deterring smoking, especially among young people. Raising taxes on tobacco products is seen to be one of the least expensive and the most effective tools in countering the influence of tobacco companies. But it is also the least implemented, with only 10 percent of the world’s population currently living in countries with sufficiently high taxes. A 2010 WHO report found that 78 percent of those aged 15 years and over in the WHO member states were non-smokers. By 2025, the number of non-smokers is expected to rise to around 5 billion out of a projected 6.1 billion people aged 15 and over. Currently, nearly a third of all men are smokers, making the prevalence of smoking among men considerably higher than among women. Over the past 30 years, smoking among men has decreased by 10 percent. Increasing prices and adding tax measures on tobacco products has been used to decrease the demand for cigarettes. Many countries have successfully used tax policies to regulate the price of cigarette products. 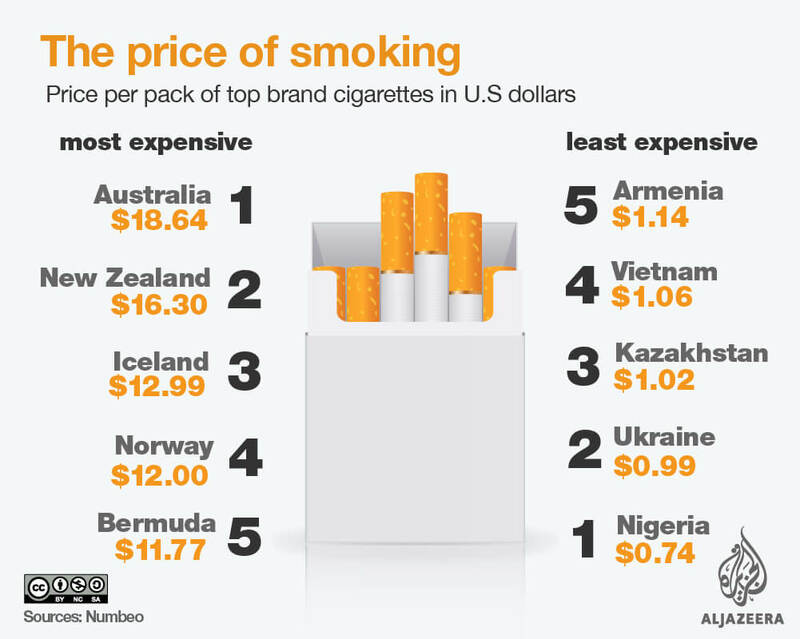 In Australia, a pack of cigarettes can cost up to $18, making it the most expensive country to buy cigarettes. A report by the Australian Institute of Health and Welfare (AIHW) in 2016 found that the smoking rate in the country was at an all time low. In the last 20 years, smoking had decreased by almost 50 percent. The study showed that less than 13 percent of Australians are daily smokers and fewer people are starting to smoke. The report cites Australia as having one of the lowest smoking rates in the world, in part because of their implementation of increased taxes on tobacco products, plain packaging, and more restrictive smoke-free environment laws. The tobacco industry and other interest groups argue that increased taxes on tobacco products allows an illicit black market trade in tobacco to thrive. But the WHO says that high-income countries with taxes on tobacco products do not face widespread issues related to illicit trade, while low-income countries continue to do so, precisely because of weaker tobacco-control programmes and taxes. Nearly 80% of the world’s smokers live in low to middle-income countries. Mumbai: To mark ‘World No Tobacco Day’ which falls on May 31, more than 40 Non-Governmental Organisations, (NGOs) in collaboration with the Tata Memorial Hospital, Parel have formed a coalition to reduce the consumption of tobacco in India. Dr. Pankaj Chaturvedi, professor and surgeon of Tata hospital, said that every third person in India consumes tobacco in different forms. He stated that the theme, ‘Tobacco- a threat to development’ specifically highlights the link between the use of tobacco products, tobacco control and sustainable development. Dr. Chaturvedi further said that 33 per cent of tobacco users die a premature death due to cancer, heart attack, lung diseases, stroke etc. A smoker loses 8 years of his life due to this addiction. “Tobacco is responsible for nearly 50 per cent cancers in India and 90 per cent of mouth cancers. Half of the mouth cancer patients die within 12 months of diagnosis,” said Dr. Chaturvedi. Dr. Vijay Satbir Singh, additional chief secretary Public Health Department said that the main aim is to regulate the consumption of tobacco by implementing the Cigarettes and Other Tobacco Products Act (COTPA Act). “The main challenge is to enforce traders to implement the warning signs and stop selling loose cigarettes. Stern action will be taken against those who are not following the law,” said Dr. Singh. The Cigarettes and Other Tobacco Products (Prohibition of Advertisement and Regulation of Trade and Commerce, Production, Supply and Distribution) Act, 2003 was enacted in 2003 to prohibit advertisement of tobacco products and to regulate them in India. The Act prohibits smoking of tobacco in public places, except in special smoking zones in hotels, restaurants and airports and open spaces. Advertisement of tobacco products including cigarettes is prohibited. Tobacco products cannot be sold to person below the age of 18 years, and in places within 100 metres radius from the outer boundary of an institution of education. Tobacco products must be sold, supplied or distributed in a package which shall contain an appropriate pictorial warning, its nicotine and tar contents. TODAY is World No Tobacco Day. Although in most countries the proportion of people who smoke continues to fall, campaigners see the glass as half full. 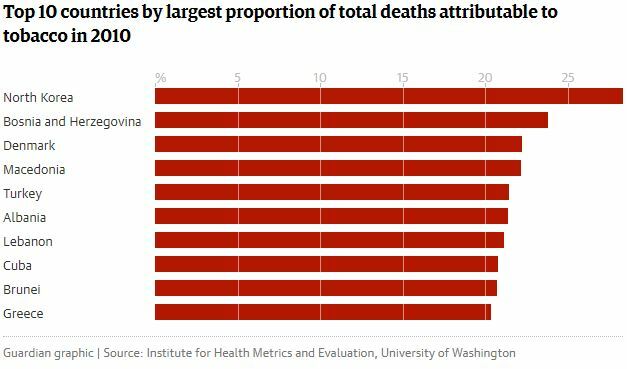 In 24 countries smoking causes the largest share of the overall burden of disease, measured in years lost to ill health and premature death. In another 37 countries it ranks second. Most of these 61 countries are rich. Although their smoking rates are falling, much of the decline is because fewer young people are picking up the habit, rather than because older smokers are quitting. The harms from smoking affect people most seriously after middle age, so countries where smoking became popular a generation or more ago are worst affected—for now. 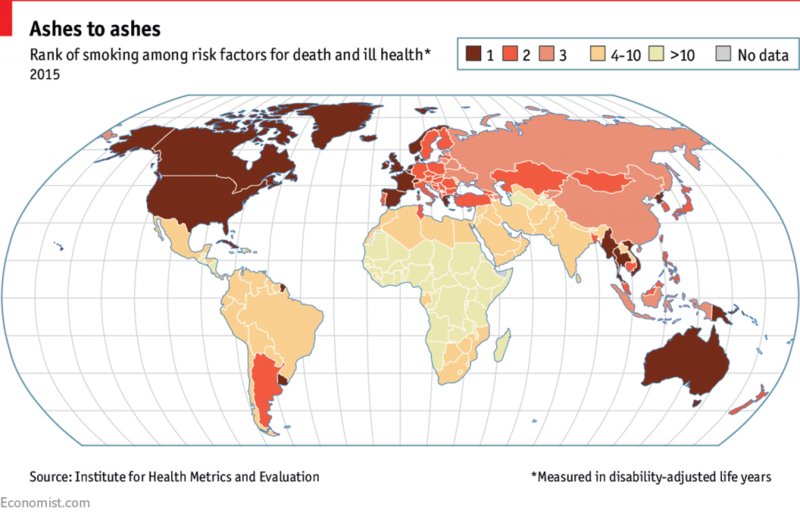 In poor countries, smoking is still a less important cause of death and disability than several other things, such as dirty water and malnutrition. Few African and Asian women light up—smoking is often socially acceptable only for men. 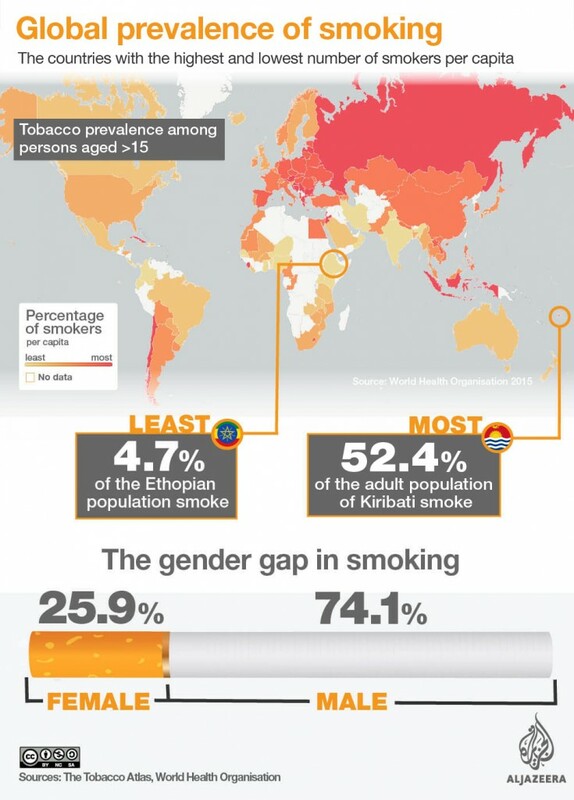 In many of the poorest countries, smoking is still uncommon—though in some it is on the rise. As developing countries grow less poor, other harms will dwindle and smoking will start to look deadlier by comparison. People in the most deprived areas of Northern Ireland are almost three times more likely to smoke than their better off counterparts according to the Public Health Authority NI. Considered by the World Health Organisation to be a blight on health, the environment and household income, the international health organisation also revealed today – on World No Tobacco Day – that globally, there are 226million adult tobacco users living in poverty. 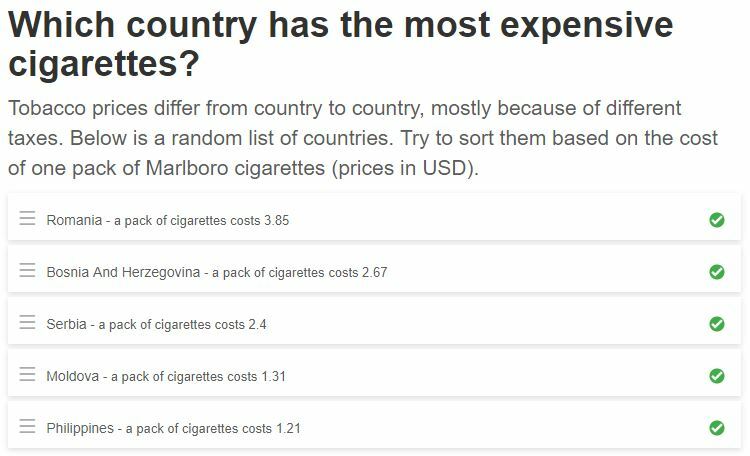 And in low income countries over 10% of a smoker’s budget can be spent on tobacco products, meaning less money for food, education and health care. “Tobacco use hits the poorest people the hardest and exacerbates poverty,” said Dr Margaret Chan, Director General of WHO. “Spending on tobacco products often represents more than 10% of total household income. Closer to home, the Public Health Authority said it is currently estimated that around 320,000 people aged 16 and over smoke in Northern Ireland, with men (23%) slightly more likely to light up than women (21%). But, in line with global trends, they said there is also a strong link between smoking prevalence and deprivation here, while those in manual occupations are three times more likely to smoke than professionals. The 2015/16 Health Survey NI found that 36% of respondents in the most deprived areas used tobacco, but this figure is just 13% among the more well off. And while the number of smokers is falling, with 80% of those who still do forgoing the addiction in their homes and cars, there is still more work to be done. “Protecting people from tobacco smoke is a key objective set out in the Ten Year Tobacco Strategy for Northern Ireland,” said Colette Rogers, Head of Health and Social Wellbeing Improvement from the Public Health Agency. “Therefore, the Public Health Agency would welcome a ban on smoking in cars as a means of protecting young people from exposure to second-hand smoke, improving people’s health and helping to reduce the uptake of smoking in Northern Ireland. “Smoking remains the single greatest cause of preventable illness and premature death in Northern Ireland so we urge smokers to quit by seeking the help of their local stop smoking service. “In Northern Ireland there are more than 650 free PHA-funded stop smoking services which are run by specially-trained staff who can advise on the best way to stop smoking. Higher taxes on tobacco products reduce tobacco consumption and improve public health, while also increasing government revenues that can be used to fund priority investments and programs that benefit the entire population. Today marks the passing of the 30th World No Tobacco Day, designed to encourage smokers to abstain for a day in the hope that they might quit. Yet it seems the annual event is doing little to help people kick the habit, despite support from big investors such as Axa and Calpers who are using the day to encourage a reduction in tobacco investment. According to a survey of EU citizens, published by the European Commission to coincide with World No Tobacco Day, there has been no decrease in the number of daily smokers since 2014 – and even an increase among 15- to 24-year-olds. “The increase in youth smoking rates illustrates the urgency for member states to enforce the provisions of the Tobacco Products Directive, which forbid attractive cigarettes aimed at enticing young people,” said EU commissioner for health and food safety Vytenis Andriukaitis. The directive, which came into force in May this year, forbids tobacco manufacturers from marketing products as flavoured and requires them to cover 65 per cent of the packaging in health warnings. Yet the overall smoking rate in the EU has remained at 26 per cent since 2014 and has risen from 25 per cent to 29 per cent in people aged 15 to 24. Smoking in the UK sits fairly well below the European average, with 17 per cent of the population taking a daily puff. Greece, Bulgaria, France and Croatia all rank highly, with smoking rates in each country above 35 per cent. Yet in Sweden, only seven per cent of people will regularly smoke a tobacco product. Axa, Calpers, Scor and AMP Capital are putting their weight behind the push to quit, sponsoring the world’s first global investor statement on the subject. It aims to “make visible the strong support within the financial community” for the World Health Organisation’s (WHO) framework on tobacco control and encourage stakeholders to act against tobacco investment, Axa said. Axa and AMP Capital divested from tobacco last year, while Calpers did so 17 years ago and has since widened its ban to include externally managed funds. 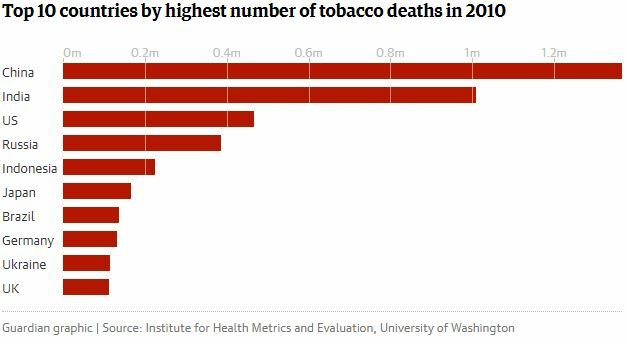 The substance kills more than seven million people each year according to WHO, which has coordinated World Tobacco Day since the first event in 1988, and costs households and taxpayers more than $1.4trn (£1.1trn) in healthcare expenditure and lost productivity. Majority of young Malaysians are well aware of the health hazards of smoking, but few would actually take them seriously. A survey conducted by National Cancer Society Malaysia (NCSM) on 143 students aged between 13 and 17 from four schools finds that 85% of students know that tobacco could lead to lung cancer while 95% know smoking is harmful to health. However, 70% of students say they started smoking when they were 12 to 15 years old. NCSM president Dr Saunthari Somasundaram told Sin Chew Daily they had organized the campaign to help school students quit smoking. “From there we can learn more about these youngsters’ knowledge, attitude and behavior towards smoking. Alarmingly they are well aware of the various health hazards in relation to smoking, but they do not have the right ‘opportunity’ to quit. Unfortunately, she said, many parents did not support their children to join the event for fear their smoker identity would be exposed. According to The Tobacco Atlas published by the American Cancer Society in 2013, 19% of Malaysian teenagers smoked every day, including 17.1% of men and 1.9% of women. May 31 is World No Tobacco Day. The theme for this year is: Tobacco, a threat to development.